Calderdale Council has declared a ‘climate emergency’ in a bold move to step up its action to help tackle climate change. This comes after Cllr Daniel Sutherland, Cabinet Member for Planning, Housing and Environment, put forward a climate emergency motion at Full Council on Wednesday 30 January. This was in response to the warning from the United Nations Intergovernmental Panel on Climate Change that there are just 12 years left to limit global warming. The motion said that failure to act will see a significant increase in sea levels and flooding, extreme changes to weather patterns, crop failures, extinctions of plant, insect and animal species and global economic disruption. The motion asked Cabinet to set up a Calderdale Climate Change Committee; to set a new target and action plan for Calderdale to be carbon neutral; and to work with other councils and the West Yorkshire Combined Authority on carbon reduction projects. It also called on the Government to provide the resources and powers needed in Calderdale to contribute to reducing carbon nationally. Although the Council and Calderdale are on track to reduce carbon dioxide emissions by 40% by 2020 and 80% by 2050, further action is needed to help keep global temperature rises below 1.5OC. On Monday 11 February, the Council’s Cabinet will discuss plans to address this challenge through proposed updates to its Environmental Policy Statement. The Council has taken leaps forward in the last nine years to help build a sustainable future for Calderdale – one of its key priorities. Achievements include cutting the Council’s CO2 emissions by 35% and the whole borough’s by 26%; reducing the Council’s use of paper by a third; introducing multi-material waste recycling across Council sites; doubling Calderdale’s waste recycling rate to 50% (well above the national average); and being the first council in the UK to create a borough-wide household food waste recovery service. Innovative joint schemes are helping to make good progress, such as Calderdale Community Energy, the 6C Energy partnership to help businesses save energy, and White Rose Energy, Better Homes Yorkshire and the Affordable Warmth Fund to help people heat their homes efficiently. However, there are still local issues to tackle, including poor air quality and resulting health issues in some areas; wildlife habitats at risk; and large amounts of plastic blighting our beautiful countryside. The proposed changes to the Council’s Environmental Policy Statement include adding priorities like increasing work with schools and businesses to reduce energy use; improving air quality by encouraging more active forms of travel; enhancing natural flood management such as erosion control; requiring sustainability to be built into developments through the Local Plan; and building on the work to make good, sustainable food the easy choice for everyone. Any work going forward would be closely linked to the Council’s Inclusive Economy Strategy, Health and Wellbeing Strategy, Tree and Woodland Strategy and Air Quality Action Plan, to help achieve the mission for Calderdale to be the best borough in the North. The Cabinet proposals support the Vison2024 for Calderdale. In the year 2024 Calderdale will celebrate its 50th birthday. Where do we want to be by 2024? 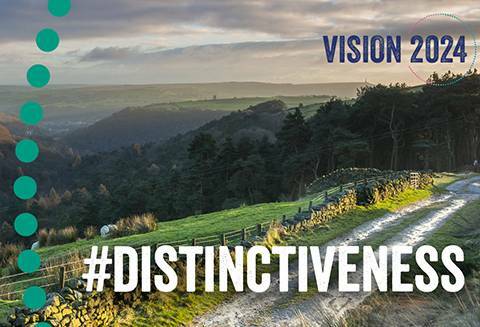 Join the conversation by following #VisionCdale2024 on social media and visit www.calderdale.gov.uk/vision. Protecting the local environment supports the Vision’s key themes of distinctiveness and resilience, by helping to ensure that Calderdale remains an outstanding place for generations to come. The Cabinet meeting will take place on Monday 11 February from 6pm at Halifax Town Hall. This entry was posted in Environment, Vision2024. Bookmark the permalink.